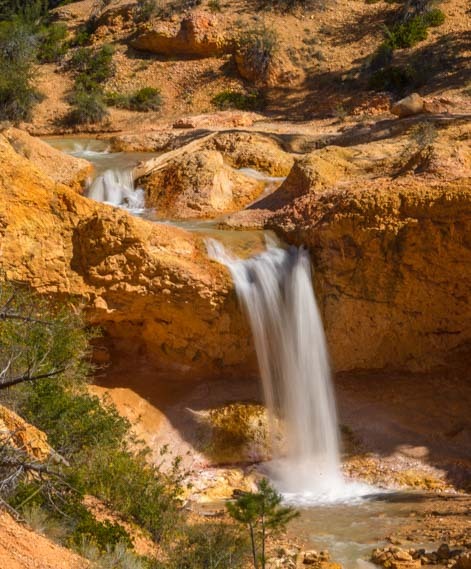 Bryce Canyon National Park – “Mossy Cave” – Mystery Waterfall! September 2016 – Just as headlines sell news stories, the same thing is true with hiking trails at the National Parks. 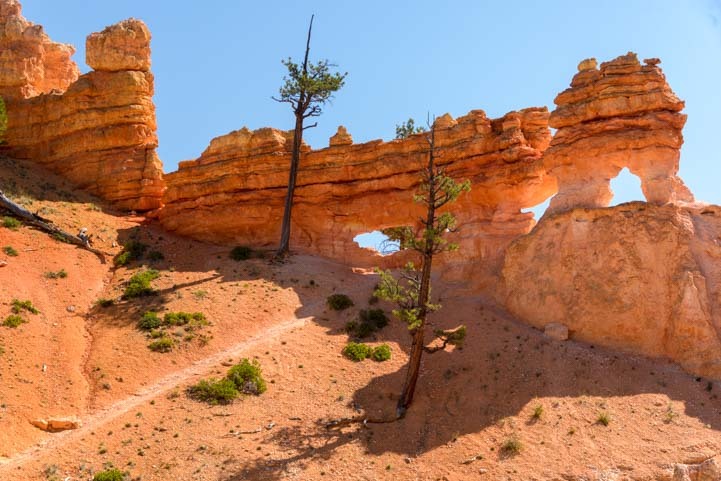 Bryce Canyon has beautiful red rock hoodoos everywhere, even on the less visited trails. 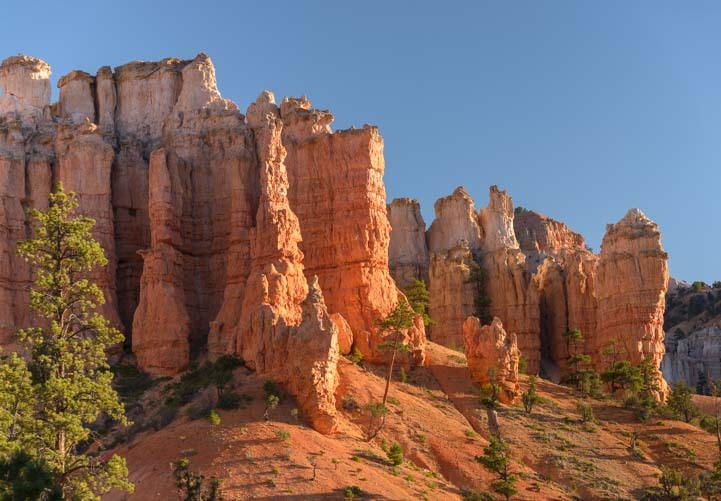 At Bryce Canyon National Park there are lots of great hiking trails and overlooks with fabulously inviting names like: Fairyland Trail, Inspiration Point, Sunrise and Sunset Points and Peek-a-boo Trail to name a few. Wonderful colors on the Mossy Cave hike. 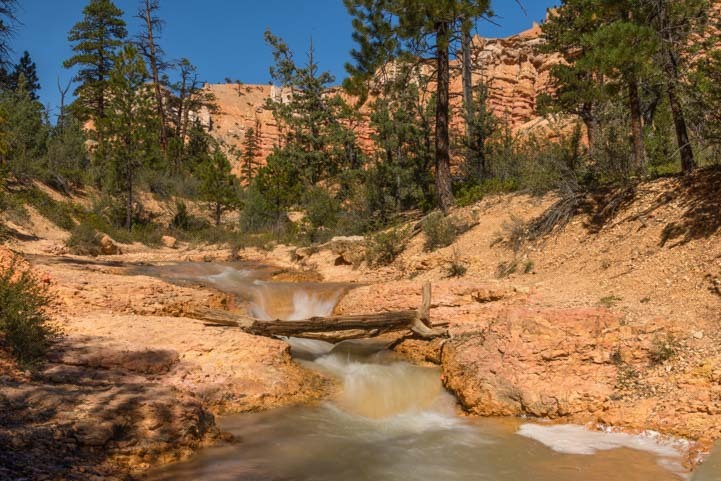 But up in the northeast corner of Bryce Canyon National Park, well off the beaten path, and not even on the main drive through the Park, there’s a hiking trail called Mossy Cave. This is an interesting name, perhaps, but it sure didn’t jump out at us and beg us to come check it out! The Mossy Cave trail crosses a cool bridge at the beginning of the hike. I wonder if because of this rather drab sounding name, other visitors respond like we do and don’t bother to drive outside the Park and around to its far northeastern edge to find out what Mossy Cave is all about. 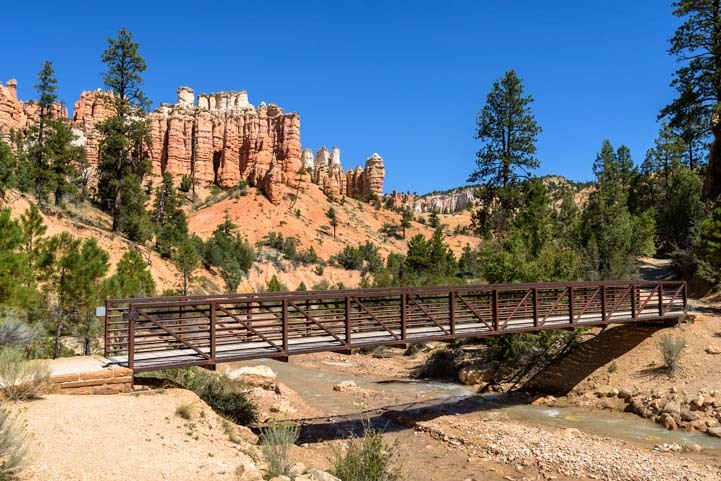 Whatever the cause, this hiking trail is very lightly used compared to the other more popular trails at Bryce Canyon National Park. “Windows” appeared high above us among the red rock formations. My suspicion is that if this trail bore the name “Waterfall Cascades” or “Glittering Pools,” both of which is has, the trail would be overrun with visitors! How fortunate that the feature this trail is named after is the other thing you’ll see on the hike — a shallow overhang that seeps water and is covered with various types of moss — instead of the beautiful waterfall! The waterfall on the Mossy Cave hike takes a lot of people by surprise! 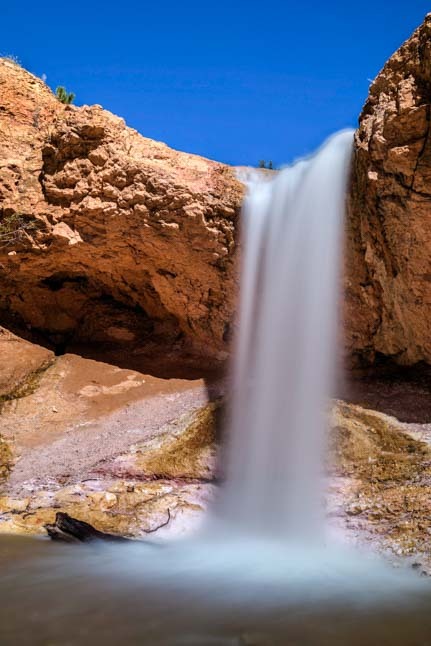 A beautiful waterfall in the desert! To a naturalist or biology expert, the mossy cave is probably the more fascinating feature on this trail. And photos we’ve seen of icicles in the cave during the winter are beautiful. However, to everyday hikers and tourists, it is the waterfall and cascades upstream from it that are the real draw! 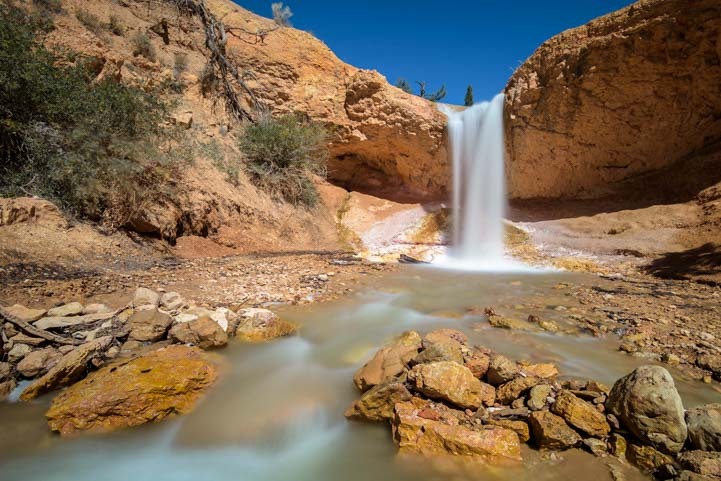 Who knew Bryce Canyon had a waterfall?! The branch canyon that Mossy Cave is in is called Water Canyon, and rightfully so. In the early 1890’s, mormon pioneers diverted some of the East Fork of the Sevier River to flow through here so they could use the water for irrigation purposes. With picks and shovels they carved a ditch and let the water flow. So, it is not a natural water course. 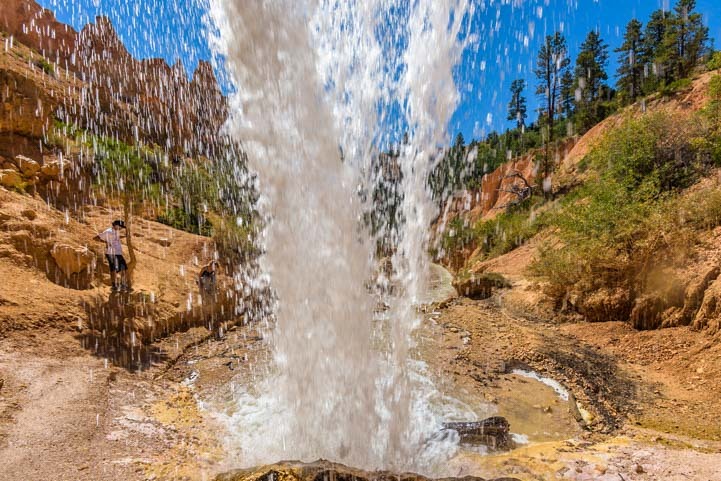 But the waterfall itself is totally natural, and the water drops down over a red rock overhang as if this year-round stream were meant to be here and had been here all along! A rush of water over the desert rocks. The overhang is fairly large, so Mark slipped in behind it to get some very cool images. 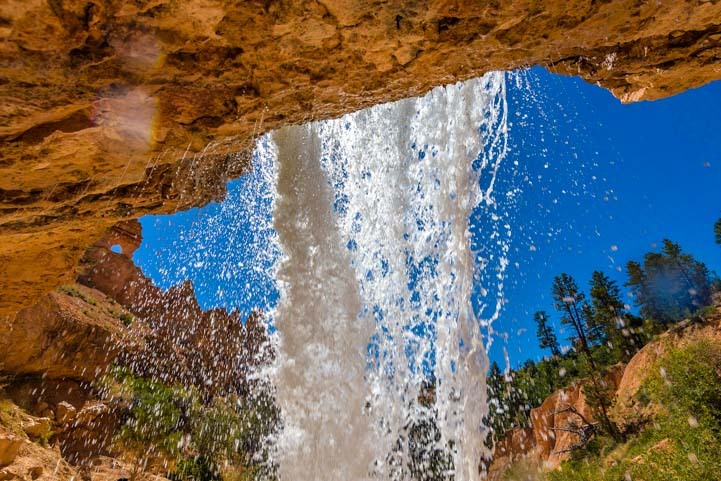 The overhang makes it easy to walk under this waterfall. View from under the waterfall on the Mossy Cave hike. How refreshing on a hot day! We walked upstream from the main waterfall and found that the stream is a babbling brook for quite a distance, tripping over stones and rocks along the way. We turned the corner at the waterfall and found the hike continues upstream. There are other smaller waterfalls too. We discovered another smaller waterfall too. We wandered back down the trail to a fork and took the path leading to the Mossy Cave. A short distance down the trail we came to the cave. The water was seeping through the rocks in such quantities that it was dripping from the roof of the cave onto the gravel floor below. Patches of moss covered the rocks, and the air was cool. The trail didn’t go inside the cave, but we could stand on one side and peer in. 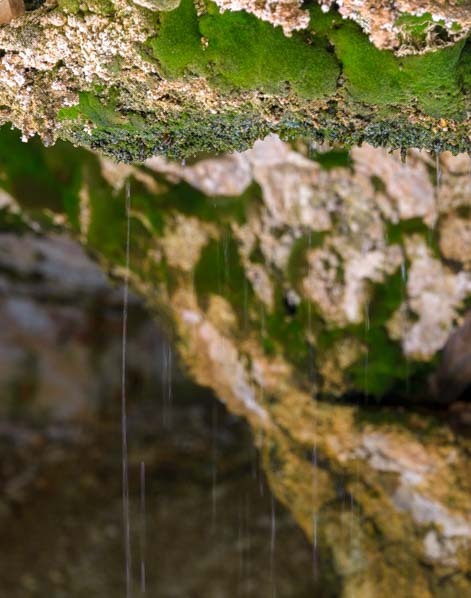 Water seeps through the rocks and drips from the moss at Mossy Cave. 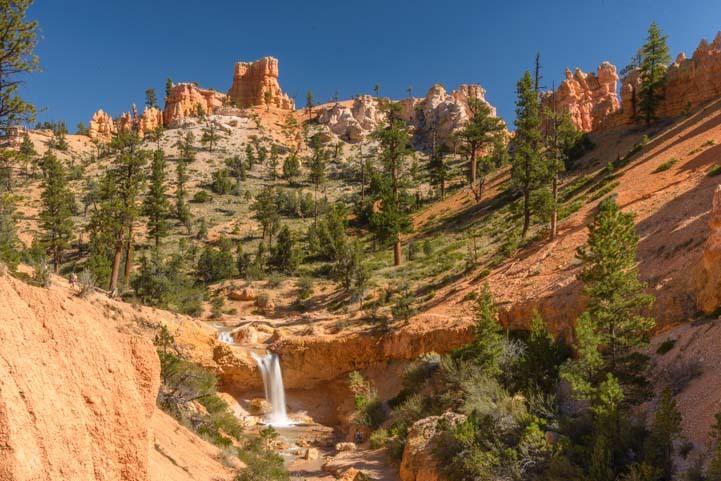 We ended up doing the Mossy Cave hike several times during our stay in Bryce Canyon. It is a short and easy trail that is lovely in both morning and afternoon light. 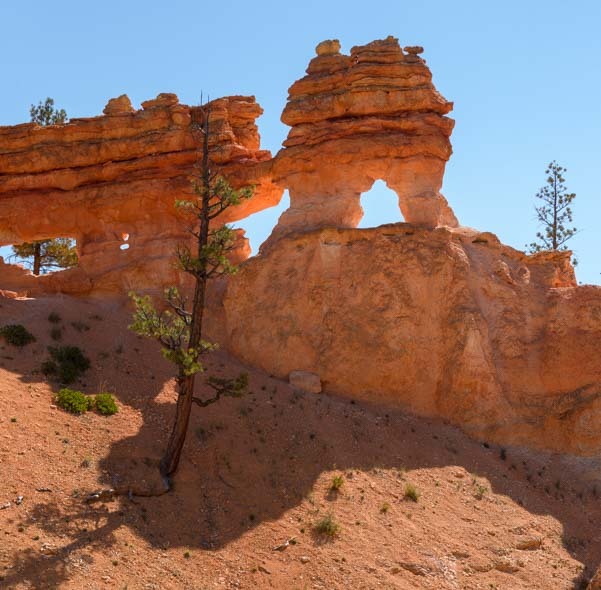 And there are some wonderful hoodoos high up on the ridges. 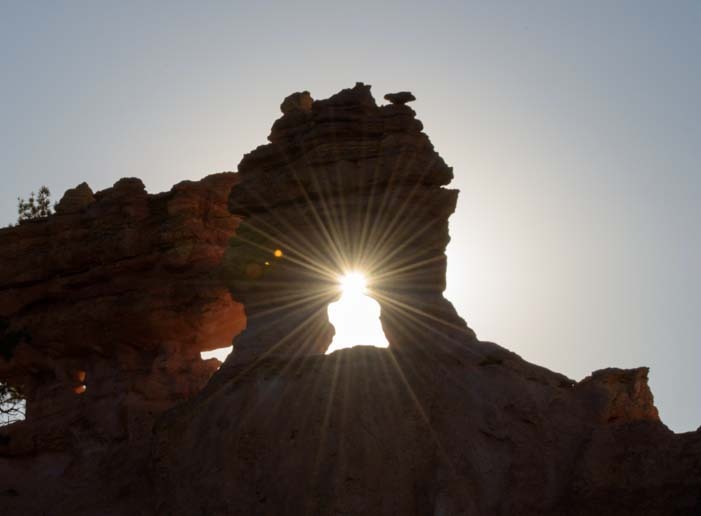 One morning, as the sun was rising, Mark caught a fantastic starburst in one of the red rock windows. 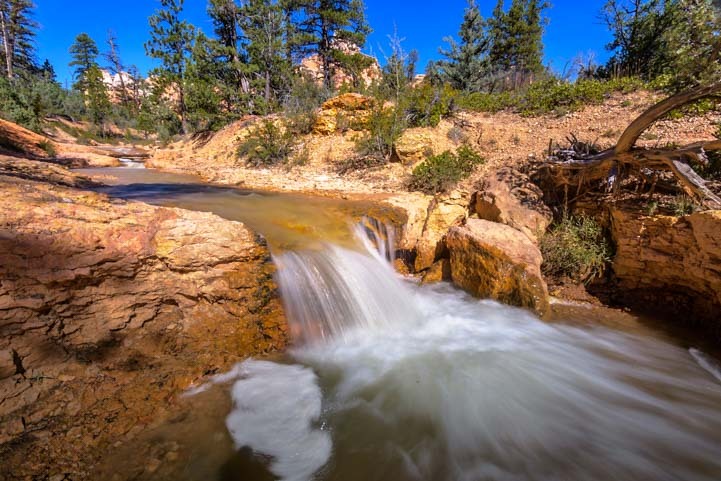 If you have already enjoyed some of the major hikes and overlooks at Bryce Canyon National Park, the Mossy Cave trail makes for a very pleasant trek. And on a hot day, what could be better than hanging around a waterfall! 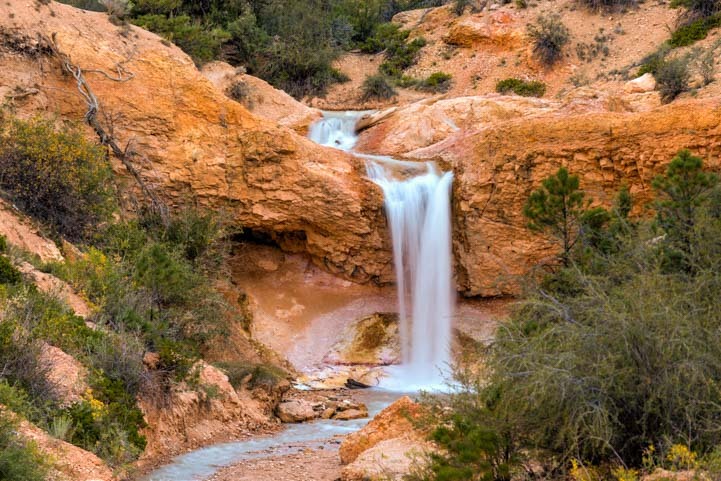 This entry was posted in Utah and tagged Bryce Canyon National Park, Desert and Water, National Parks US, New, Travel, USA, Utah, Utah Southern, Utah Southwest, Waterfalls, WP Travel by Roads Less Traveled. Bookmark the permalink. Looks like yet another gem hidden in plain sight. Do you know if this trail is dog friendly? We travel with our two Huskies, Boo and Togo, and they love hiking in the hoodoos as much as we do. The National Parks don’t allow dogs on their trails. 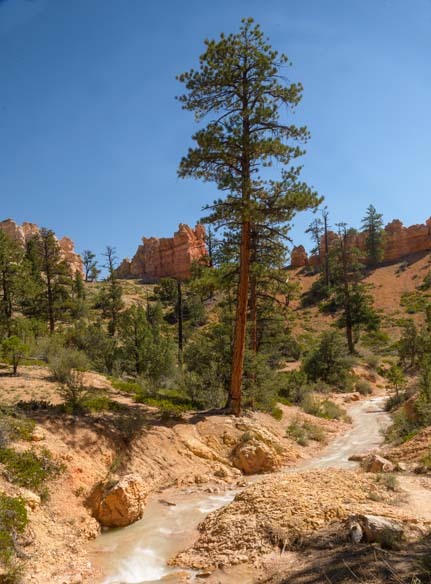 For that reason, we stick to the trails in the Red Canyon area that do allow dogs among the hoodoos. Hoodoos and Hounds, great fun! You’re so right, Lew, this is a true jewel hidden in plain sight. I don’t know if it is dog friendly, but I’m sure a quick call to the NPS at Bryce Canyon would sort that out. Thanks for introducing us to Mossy Cave and the waterfalls. Your photos are beautiful as always. Thank you for appreciating our pics, Lynda. 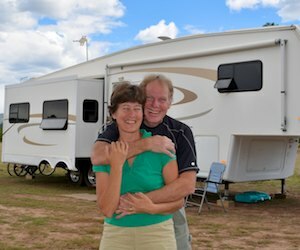 This is a fun little spot away from the crowds! Wow, once again great writing coupled with beautiful photography. 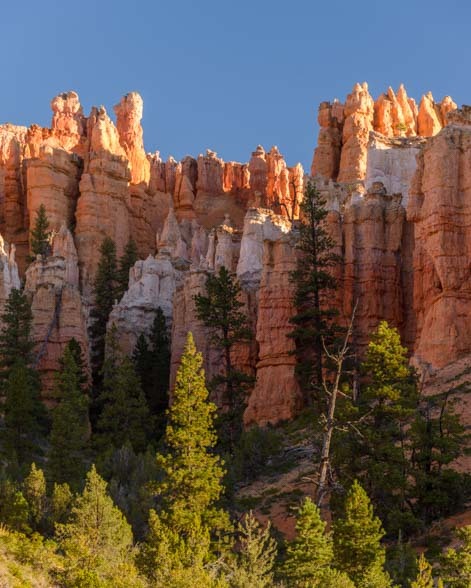 Can’t wait to see Bryce Canyon myself! Thanks, Don. It is a magical and very photogenic place! it is beautiful thank you. Have fun! 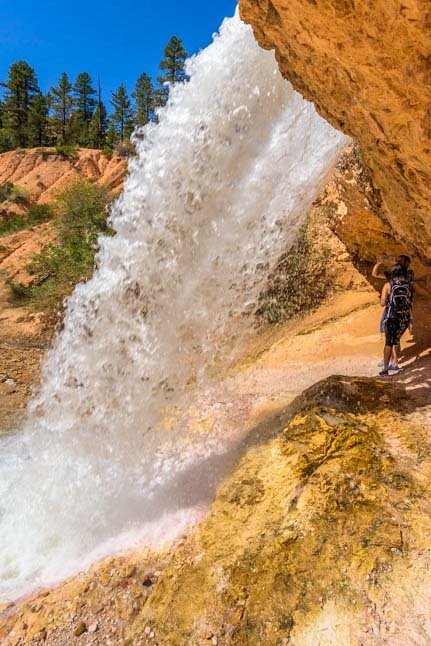 Lots of info and pics on various easy hikes among our “blog posts from Bryce Canyon” links above on this page (Rim, Navajo, Fairyland, Peek-a-boo, Queen’s Garden trails and Mossy Cave (described on this page)). Wow, my favorite National Park and I had no idea there was a waterfall there. Amazing! I’m guessing it was quite a hike to get to it? That would explain my ignorance. Beautiful. Thanks for sharing my friends. It’s an easy and pretty hike, Rose. Well worth doing! Thanks for sharing that waterfall hike. I’m sure we’ll be back there again and we’ll definitely look for that.